It was somewhere here, now we can't find it. Where it could be? No one in this house seems to know. anywhere. As if it grew legs and walked off. My wife declares– we lost love! I say I still have love. It's got be something else. Our children suggest perhaps we lost our fear. our lives will never be the same. Was it a good thought? a song, our anger, our devotion to God? in its palms before submitting everything to the ocean's feet. The delta is composed of only purified dirt. from Bansberia, Hoogly and beyond. to remember their deaths, their starvation. each of them widowed while in their teens. as if I am a living superstition. into your own flesh you know." "Yeah, you can say so. than what you originally had. It creates bone islands, fleshy gorge." "I see, sounds like an army battalion." between the good and the evil." own organs can do it, surely." Copyright 2008, Sankar Roy. © This work is protected under the U.S. copyright laws. It may not be reproduced, reprinted, reused, or altered without the expressed written permission of the author. 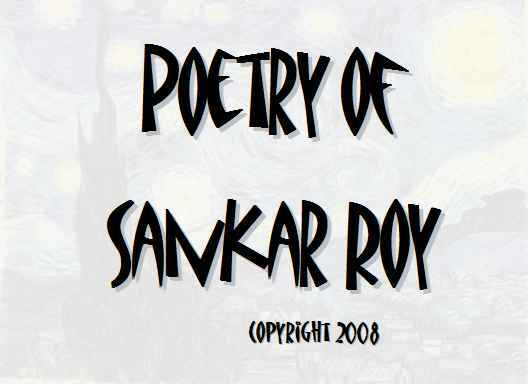 Sankar Roy, originally from India, is a poet, translator, activist and multimedia artist living near Pittsburgh, PA. He is a winner of PEN USA Emerging Voices, author of three chapbooks of poetry– Moon Country, The House My Father Could Not Build and Mantra of the Born-free (all from Pudding House). He is an associate editor of international poetry anthology, Only the Sea Keeps: Poetry of the Tsunami (Rupa Publication, India and Bayeux Arts, Canada). Sankar's poems have appeared or forthcoming in over fifty literary journals including Bitter Oleander, Crab Orchard Review, Connecticut Review, Harpur Palate, Icon, Runes, Rhino, Tampa Review and Poetry Magazine.